It's been a couple of weeks since we last did a "general" post, so I think it's about time for another one. I know things have been a bit slow for updates over the last couple of weeks, but there's a lot happening in the background. Thanks for your patience with everything, and all the input on everything. I’d also like to know the progress on open-source, I’m loving Tildes so far, but wasn’t it supposed to be open-source more than a month ago? Yeahhhh, it was. I've ran into a few hitches with it, and overall just keep delaying it because I've been more worried about dealing with various things happening on the site than finishing it up. It's very close though, I just need to finish a couple last things, so I really just need to focus on those soon and do it. I'd suggest that finishing those proto-mod features like tagging and moving posts should be a high priority for you. This would have a multiplier effect: finishing these features would allow you to delegate some tasks to other people, freeing up your time to work on the things that only you can do. You'd get more hands on deck, rather than just your own two hands doing everything. There's not really any particular percentage, I've got a test version of it working fine but I was still indecisive about some of the interface parts of it. I should probably just get a basic version of it out at least, even just super basic search of titles / post text would be a lot better than the current nothing. Any thoughts on search features? I don't like having to navigate back to the main page to change groups. Sometimes I type it in the browser address bar, but clicking to the main page seems faster. Agreed, I'd like to probably allow people to set up custom shortcuts in the empty space in the middle of the top bar (when you're on desktop, at least), or potentially allow an optional bar down the left side for subscriptions/shortcuts instead. In the meantime, maybe I should just put your list of subscriptions in the sidebar of every page? It's not really being used for much else right now. Why not the right side, after the sidebar's regular content? I'm just expecting the right sidebar to eventually have a lot of other stuff in it. An option might be possible as well. Long term, a customization hotbar like what RES offered would be cool, but in the short terms something as simple as this would serve well. I think putting the subscription list in the sidebar is a good short-term solution. But I do understand there's much more pressing things to address so it's not like it's a huge deal. For the moment, Tildes Extended has a button that moves you to the next unread comment. It's so much nicer to use tildes like that. And I'll second the timeframe tweak for viewing new comments, I've occasionally had to click on a link after I've previously clicked on it without reading the new comments and they were cleared. Thanks for pointing out Tildes Extended. I disabled some of the other features, but jumping to next unread comment and Markdown preview are great. I definitely agree with you on that, those are definitely very useful features and I'm happy to help more people enjoy them. Yeah, something I've worked on a little bit (but not ready for deployment yet) is having threads you come back to showing only the new comments as well as their direct parents. Chains with no new comments will be fully collapsed, while other comments inside the visible chains will be more "individually collapsed". I think this should work really well (especially when combined with the ability to change the "new comments since" threshold, like you mentioned). Has the Tildes UI been developed with accessibility in mind? I'd like to invite some visually impaired friends to join, but I won't do so without ensuring that they won't have any problems using screen readers. I've tried to do it with it in mind, but I'm not an expert. The HTML is pretty semantic, and I've done a few things such as specifically altering the source order of objects (and laying them out with CSS grid) that I know will work especially well for accessibility. There are some other things that I know aren't right though, and I need to fix them up. I'm hoping that when it's open-source, some people that are more knowledgeable about accessibility will help fix up various issues with it. CSS grid is pretty amazing. Glad you're using it. One thing that I would like to see soon-ish is filtering-in of topics. For example, I would like to read posts tagged Dungeons and Dragons, but I don't care about 98% of the other topics in ~games, so I unsubscribe. If I don't occasionally go to the ~games group to look for posts (and be reminded of why I unsubscribed in the first place), I'll completely miss out on topics that might be of interest. Right now, with the limited amount of both posts and groups, it's fine, but I imagine with more users, I would potentially miss more topics of interest. Which doesn't seem ideal in for interest based discussion. Thanks, while I'm aware that a specific tag can be filtered to, it's nicer / more user-friendly to just have it on the front page with everything else. I keep wanting to see a markdown/html preview of my comments and posts. Everything else is looking good though the default # of posts shown could be a little lengthier (I think the default filtering is 24 hrs, maybe moving it to 3 days would be better, it would bring back discussion to slightly older posts). The good news is that with Tildes Extended you can have a markdown preview. Default sorting is currently by activity, last 3 days. You can set your own default for your home page as well as each group individually though. It's currently defaulting to 24 hours for me (although if I switch it to 3 days, I don't get the prompt to set that as the default). Ah thanks, it looks like I made a mistake while rearranging some related code that's causing it to end up at 24 hours instead of 3 days. I'll fix that. Is there/can there be a way to add and edit tags on your exclusion filter other than typing them in via the comma delimited text? On the tag filters page, would be nice to have a bit more UI interaction to manage adding and removing, rather than just editing via the full string in the input. For adding tags to your filter list, was thinking that if I click on a tag and view the tag-specific feed, could have a link somewhere on that page to add the tag to your exclusion list directly. Then it's just two clicks to exclude when you come across a particular tag, rather than copy-pasting and navigating back around to the filters page. I'd definitely like to work more on this in the future, but it probably won't be a priority for a while. One thing is that I specifically don't want to make it too easy for people to add new filters, I think it should be a really conscious choice. I think if it's too easy, people will jump to adding filters whenever anything slightly annoys them, and that has the potential to end up in kind of a bad situation where a huge portion of the users are filtering out a ton of the posts (and maybe not realizing how much they're missing). Maybe putting something like "There are currently X threads filtered on this page" under the "Filtered Topic Tags" area might be useful to see how much one is missing. First, thanks for working on this! Could we have some basic stats on us? Like really high level tildes.net analytics? I am curious what platforms we are browsing on, and what countries the activity is coming from. Any other generic data would be interesting as well. I don't know if this has been said before, but you should at least introduce Tildes actively on Reddit. There's a lot of people displeased with Reddit for different things (redesign, tracking, it being Facebook faster and faster) but they have no idea sites like these exist. Even if you don't open registration, it would help if people knew it existed. I found out about tildes via reddit but I had to wait about a week before I could post in an invite thread on time in order to join. Advertising a site that you can't sign into is a mistake that was made by Google+ that cost them a lot of good faith from potential users IIRC. That's correct, and it also hurt Imzy for the same reason. Before we start truly, actively promoting tildes to everyone it needs to be a bit more polished/finished first - search, more tag features, early moderation systems, source published. I expect it'll also change to be readable without an account at that time. That'll be the time to really start sharing it around. Until then, we just toss up invite threads when there's a spike of interest, and give everyone their own invites to hand out. When reddit has one of their anti-admin tirades, people usually mention tildes in them already, and we get a fresh batch of new invitees to check out in the /r/tildes waiting room. you should at least introduce Tildes actively on Reddit. That's exactly how I learned about Tildes. That sub is not active though, but I guess waiting for at least Beta before introducing Tildes instead of Alpha makes sense. 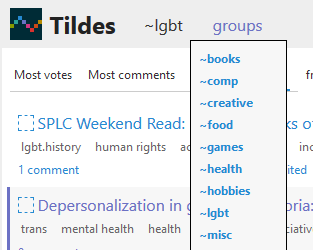 Well, if you already knew about /r/Tildes, what did you mean by "introduce Tildes actively on Reddit"? As I said, I came to /r/Tildes via a post or comment in another subreddit (I forget exactly how). And I've seen a few posts about Tildes in various places. What does "introduce Tildes actively on Reddit" mean to you? Maybe not Deimos personally but I was thinking, as a group effort, we could bring up Tildes when discussion about Reddit's bad sides start. It gets brought up fairly regularly in a lot of comment threads where people are talking about alternatives to reddit, and it's had multiple prominent submissions in /r/RedditAlternatives, /r/TrueReddit, and a few other subreddits. There aren't really a lot of large places for me to "introduce" it though, it doesn't really fit the content of most of the large, popular subreddits. Ah-hah! Thanks for the clue. I could not remember how I found out about Tildes - but, yes, it was this now-deleted post in /r/TrueReddit. Weird, I can still find that post in "top" in TrueReddit (it's currently #101 in top / past year), but it does seem to be deleted (won't come up in search or anything)... is reddit no longer removing deleted posts from "top"? That user who made the original post deleted their account, so that's why it's stuck in one of reddit's quasi-temporal there-not/there states. Is it possible to set my preferred display theme as [a persistent] default? I'm guessing the pref is cookie-based since it doesn't stick between sessions. There was a thread about this specific issue a few days ago. It's just stored in a standard cookie, so if you're wiping those on each session it'll be lost. As mentioned, I'll probably add the ability to set an account default as well. Ah, I figured that had to be it... Thanks for the response, and for the link! I suggest that we have a private notifications feed feature where one can follow a private RSS feed to know when they receive a notification, like reddit's your inbox feeds. I think it would be nice to have official support for custom CSS, or maybe custom color palettes as a simpler solution? Do you mean from a group perspective (similar to subreddits having their own themes on reddit), or an individual user perspective (you making your own customizations to the site's appearance)? Individual user, since there's no "ownership" of groups it doesn't make much sense to theme them imo. Any reason you don't install Stylus or a similar browser extension that lets you do your own CSS customizations on all sites? This is a tiny thing, but is it possible to have the option to open links in a new tab automatically? I'm so used to that with Reddit that I often navigate away when clicking links here, and then I have to backtrack to go check out the comments. Tildes Extended, which is an addon made by @crius, has an option to open new links in a new tab. It's definitely possible, which links are you wanting this to cover? Only the external links on actual link topics, or also things like links to comment threads, and links inside text posts and comments? I'm not @parenthesis (obviously) but, for me, I'd like it if non-Tildes links opened in their own tab, no matter where I clicked on them: link posts, text posts, even comments (although this one might not be doable). Anything which takes me to another website should open a new tab, leaving my Tildes tab untouched. However, if I'm navigating within Tildes, that can use the current tab. I think all links would be nice! So including links to comment threads and links inside posts.